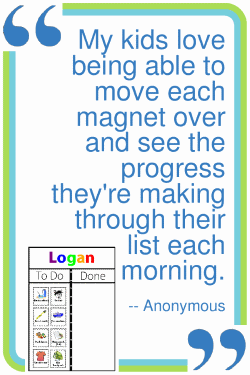 The Magnetic Checklist Activity lets you create magnets that you can print yourself at home. Choose the picture and text, print onto regular paper, affix the paper to an Adhesive Magnet Sheet (available for $3.95) and then cut apart your magnets. It's easy! These items can be turned into magnets with the Magnet Bundle. Drag and drop items on and off the list. Click the text to rename an item. Start a new list to save this one.